Louis Farrakhan to ADL: "Allah and His Messiah will bring you and your people to disgrace and ruin"
The tweet heard ’round the Jewish world. Jewish historians now admit that today’s brutal occupants of Palestine are genetically unrelated to any of the good people in the Bible, thus establishing that their 71-year tyranny in the holy land is but another white supremacist colonization scheme. The Boycott, Divestment, & Sanctions Movement (BDS), which has isolated the apartheid state, has forced Israel to take ever more desperate and repressive measures. The “war in Syria” was exposed as an Israeli oil theft operation. There is the increasing momentum of charges that Israel masterminded 9/11and that Israeli operatives are the likely suspects in the continuing false-flag terrorism attacks around the globe. So despised is the Anti-Defamation League (ADL) that it was run out of its “racial mediator” role in last year’s Starbucks incident by a single tweet from activist Tamika Mallory. The Women’s March continues to grow in influence and power despite Jewish attempts to undermine its progress. American police departments with atrocious records of racism and shootings in case after case are shown to have been “trained” by ADL and Israeli forces. The manipulation of “anti-Semitism” statistics by the ADL—which were found to be inflated by thousands of “anti-Semitic incidents” that were committed by a single Israeli Jew—has been exposed. A series of sexual harassment and human trafficking crimes by Jewish men of wealth and prestige has been exposed as epidemic. Names like Weinstein, Lauer, Epstein, Dershowitz, Moonves, Kraft are appearing with unseemly regularity. Morris Dees was unceremoniously fired from the organization he founded, the Southern Poverty Law Center. The SPLC is the “race issues” arm of the ADL, and has scammed millions from unsuspecting and fearful Blacks and Jews, claiming to be America’s “hate watchdog.” Dees was fired for sexual harassment and for creating an intolerable climate of racism toward the group’s Black staff. The opioid epidemic—which is now said to be responsible for at least 100 deaths a day—is being laid at the doorstep of the billionaire Jewish Sackler family, owners of Purdue Pharma, makers and relentless pushers of OxyContin. The devastation on the workforce is so extensive that Fed chairman Jerome Powell said in a recent 60 Minutes segment that the OxyContin scourge is negatively affecting the U.S. economy. Harsh Jewish condemnations of the awakening voices of Black critics of Israel, like Angela Davis, Tamika Mallory, Ilhan Omar, Rashida Tlaib, Marc Lamont Hill, Michelle Alexander, and Alice Walker, have only brought them Black hero status. The exposure of Israel’s secret and ongoing espionage operation against Black youth in America, called “Israel Cyber Shield,” was a fatal blow against the alleged Black–Jewish “alliance.” The COINTELPRO-like operation is responsible for the attacks on the above-mentioned Black thinkers, as well as the instigation of Amazon’s book purge. Israel’s longtime face of Apartheid, Prime Minister Benjamin Netanyahu, was indicted for corruption. His leadership of the now internationally acknowledged genocide against the Palestinians has made it nearly impossible for Israel to maintain international toleration. Netanyahu merged his right-wing party with the “Jewish Power” Party, the most racist party in Apartheid Israel. And this follows the Knesset’s passing of the nation-state law giving civil rights only to Jews. The Talmud, the ancient Jewish rabbinical writing that the Israelis would like to make the law of the land, has come into intense scrutiny as a document that says Jesus deserved death by being boiled in excrement and that his blessed mother, Mary, was “a whore.” Israel’s chief rabbi called Black people monkeys, admitting that he learned that from the Talmud. Christian churches in Israel continue to be defaced and burned by Jewish gangs. The college cheating scandal to admit less-than-deserving rich kids to elite schools was masterminded by a Jewish man and brought focus on other, past college scams that benefitted Jews. Black Jews in America are now in open revolt against white Jews, with their main spokesperson, Nylah Burton, publicly declaring, “that the only way to fix the Black-Jewish alliance is to destroy it….We need to destroy the idea that Black people owe white Jewish people support because some Jews marched with Martin Luther King more than half a century ago…” Black Jews in Israel have long suffered discrimination, poverty, and police violence. Clearly, that “disgrace and ruin” is now here. To this arrogant and intractable Jewish leadership, however, the problem IS NOT their objectionable, detestable behavior—what disturbs them is the mental awakening that they can neither control, curtail, nor redirect. All of academia ought to be frightened at these words, because The Secret Relationship Between Blacks & Jews series by the Nation of Islam is carefully constructed to present the words of the most respected Jewish scholars, and if the “historical value” of these books is now left in the hands of Amazon’s own backroom “historians” (read ADL), and not determined by readers themselves, we have a book burning of the Nazi variety. Each of the NOI books delves into the lengthy and contentious history of interactions of Blacks and Jews—through the eyes of Jewish scholars, historians, and rabbis. No matter the scholarly source, Jews MUST control the intellectual diet of the goyim at any cost and create the false idols they worship. An accompanying ADL-Amazon notice: “We reserve the right to determine whether content provides a poor customer experience and remove that content from sale.” Each of the NOI books had hundreds of reader reviews with a collective rating of 5 of 5 stars. So the “customer experience” is evident—by Amazon’s standards, such as they are. It is entirely understandable that some of Amazon’s customers may have had a poor or even shocking experience with the content of the 4-book Secret Relationship series. But that, in truth, is only proof that they are woefully ignorant of the voluminous works of their own Jewish scholars. Dr. Wiznitzer was a professor at Jewish Theological Seminary of America and president of the Brazilian-Jewish Institute of Historical Research—even though his words and authority rewrite the popular mythological version of Black–Jewish relations. Rabbi Korn gives a lecture on the subject that can be heard on the Nation of Islam Research Group website. Jewish scholar Cecil Roth says Jews were “greatest” slaveholders. His books are available at Amazon. (6) At the office of the British Jewish Historical Society, there is a bronze bust of the celebrated Jewish historian Dr. Cecil Roth, who with his many awards and honors was the editor-in-chief of the Encyclopedia Judaica. He wrote that the Black slave revolts in parts of South America “were largely directed against [Jews], as being the greatest slave-holders of the region.” Jews set up militias with the sole purpose of destroying Africans who had escaped from Jewish plantations. The Jewish militias murdered the escaped slaves and cut off their hands to award to their fellow Jews as trophies. The fact is that Amazon and the ADL can no longer conceal the incredible collection of facts in The Secret Relationship Series that place the Jewish people among the Black man’s worst historical enemies. What had previously been considered the racist acts of white Christians alone are now shown to have had significant Jewish culpability. Jewish merchants owned, insured, and financed slave ships and Jewish chandlers outfitted them with chains and shackles. Jews became the major traders in “refuse slaves”—Africans who were weak and sick from the Middle Passage voyage. Jewish traders bought them cheap, “fattened them up,” and sold them at a profit. The Gradis family of Jewish shippers had a monopoly on trade to the notorious slave dungeon at Gorée Island—the Auschwitz of the Black Holocaust. They owned 26 ships and extensive plantations in the French colonies St. Domingo and Martinique, and they developed a plan to import 10,000 slaves into Louisiana. When early New Yorkers decided to start slavery in the colony, records show they contacted “the jobbers and the Jews,” who were the recognized international dealers. The largest shipments of Africans arriving in New York in the first half of the 1700s were commissioned by Jewish merchants. The post-slavery sharecropping system that kept the ex-slave in desperate poverty and ignorance for decades after emancipation was a product of the vast network of Jewish bankers, moneylenders, and cotton traders, who flooded the South to reap the immense cotton profits. The Jewish wealth generated from these slavery- and Jim Crow-based enterprises helped finance Jewish community development, built synagogues, homes, schools, businesses, and institutions, and in many untold ways enriched their lives, congregations, and communities. Actually, one is hard-pressed to name a single prominent American Jew in the slavery era who did not own slaves or profit from Black African slavery. Over centuries Jews built this prodigious and ill-gotten wealth, then wrote themselves out of the history of slavery, and left the white Gentiles to take the entire blame for the slave trade, slavery, sharecropping, and Jim Crow. The 144-page companion volume to the Secret Relationship series is titled Jews Selling Blacks: Slave-Sale Advertising By American Jews. In effect, this collection of Jewish advertisements—the largest collection of its kind ever published—is the “dashcam video” of Black–Jewish history. The value of these original documents is that they are not filtered through any historian, rabbi, or scholar. Jewish slave traders PAID to place these ads, and the graphic detail can not be explained away. For instance, some Jewish scholars have used U.S. census records, which show “modest” Jewish slaveholding, to diminish the role of Jews as major “owners” of Black human beings. This, however, is highly misleading. The 1830 census shows that all the Jews of Charleston, South Carolina, claimed to “own” a total of 104 Black human beings. But a single Jew, Jacob Cohen, on a single day in 1857, offered for sale “125 rice negroes.” That same year, the same Mr. Cohen teamed with a Gentile and advertised almost twice that number—210—in a single day. 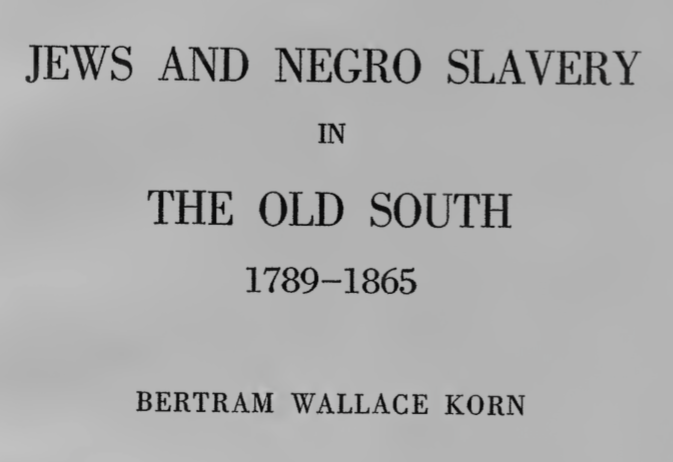 Those warehoused Africans were not counted in the census records as slaves owned by Cohen, a prominent member of Charleston’s Jewish community. Today, Mr. Cohen might have a seller page on Amazon.com selling slaves as both “new” and “used” and then encouraging 5-star customer feedback. The third and latest volume of The Secret Relationship Between Blacks & Jews was released in 2016 and focuses entirely on the notorious Leo Frank case of 1913–1915, the problematic episode that purportedly started the ADL and the KKK and is reputed to be the worst incident of “anti-Semitism” in American history—except that such claims are untrue. Leo Frank was the B’nai B’rith president in Atlanta and arguably the South’s most important Jew. He was convicted of the murder of a 13-year-old Gentile girl named Mary Phagan and he was ultimately lynched for the crime. She was a child worker at Frank’s factory who came to get her pay and was later found dead. The NOI’s ground-breaking work explodes the notion that Frank was innocent and powerfully refutes the claim that there was any anti-Semitism in the case at all. The common belief in the oppression and victimhood of the Jews in America is based almost entirely on that 1913–1915 incident, and through it they created an entirely new sympathetic image of themselves as friends of and co-sufferers with the racially oppressed. So completely does the book uncover the hidden truths about this case that one might confidently speculate that it may have actually altered the Congressional “anti-Semitism” resolution that was originally intended to target Rep. Omar. The first draft of the document mentioned the Leo Frank case as the most egregious example of “anti-Semitism” in American history, yet the mention of Leo Frank was removed in the final draft voted on by Congress. After a century of paradingan invented history of “anti-Semitism,” the Jewish propagandists may have been forced by the Nation of Islam book to retire the Leo Frank myth. S.I. Rosenbaum’s assessment in the Boston Globe that “A shocking number of Jews have become willing collaborators in white supremacy” is only shocking in its understatement. This article provides but a page or two of direct Jewish testimony of Jews in the Black Holocaust, but the 1,600-page Secret Relationship Series goes much, much deeper. The Talmud can be purchased on Amazon, though the notorious Jewish “holy book” says some of the ugliest things about Blacks, gentiles, and women ever recorded. And, most significantly, an Amazon customer can still purchase Adolf Hitler’s Mein Kampf, with the introduction written by—wait for it—Abraham Foxman of the ADL. This is not to say that these books should be banned, but since Amazon arrogates to itself “the right to make a determination on the historical value of the item,” one can readily see Amazon and Jeffrey Bezos’s supreme hypocrisy. The Bible says (Mt. 25:32) “Before Him shall be gathered all nations.” The Holy Qur’an says, “you shall see all nations kneeling before Him and they shall be judged out of their own books. [HQ 45:28]” The government keeps a record of their governmental accounts. They have books in the library and in the courtswhich tell how they have ruled the people. They have a record of how they have judged the people. The Nation of Islam researchers are under the direction of The Honorable Minister Louis Farrakhan, whose mission is to expose Satan—a dangerous assignmentthat necessitates a spiritual and mathematical grounding. 2 Thessalonians 2:3 emphatically states: “Let no man deceive you by any means: for that day shall not come, except there come a falling away first, and that man of sin be revealed”—with his own books and his own Jewish scholarship. The privatizing of the First Amendment and doling out its privileges to Jews alone are where this Satanic cabal is moving. Blacks and white Gentiles are taking a new look at the presumptions they have always taken as fact, and new racial alliances based on Truth are being formed and solidified in the process. The banning of The Secret Relationship is a sure sign that victory is near.